The act of eating, in my estimation, falls under three main categories beyond the physical need to nourish the body: reliving and satiating memories or conditioned gustatory habits (my ailing grand-uncle used to “get full” by watching my siblings and I devour his favorite dishes); understanding and setting reference points about peoples, cultures, or cuisines (travelling and/or discovering new ethnic and regional cuisines); and exploring new gourmet experiences much like finding the latest designer outfit or recreational drug (which food is for some, including me). So, when I received a text message from a friend saying that she needed to use a gift voucher for the highly acclaimed restaurant Volt and a reservation had been secured, I did not hesitate or vacillate in responding, much like an alley-junkie having stumbled across the next fix. Located in Frederick, MD, we drove 50 miles outside of Washington DC through scenic rolling hills and farmland in order to get to Volt before our 5:45 reservation. Cruising through the historic downtown area, we were immediately gravitated to its quiet bucolic charm. We managed to find parking a few feet away from the restaurant, which was immediately recognizable by its bold glaring steel letters framed by a 19th century red-brick facade. The restaurant sits on the ground floor of the Houck Mansion, a prestigious-looking Victorian building constructed in the early 1890’s, and it commands a noble presence within its vicinity. 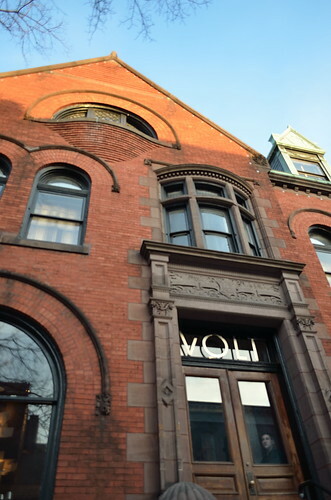 Volt was opened by Bryan Voltaggio before he shot to fame as the losing finalist on the popular culinary show,Top Chef. Entering its doors, we were greeted by an army of young staffers dressed in casual suits whose formality was mocked by brown flat Converse sneakers as their footwear. The ambience exudes luxury with the cream pale color palette from the banquette to the table cloths. I requested a table with sufficient light for my photography, and we were escorted to a corner table close to the large arched window overlooking the street. Amuse Bouche (complementary): Beet Macaroon stuffed with Foie Gras Mousse, topped with Apple Sauce and dusted with Cara Cara Orange Zest. 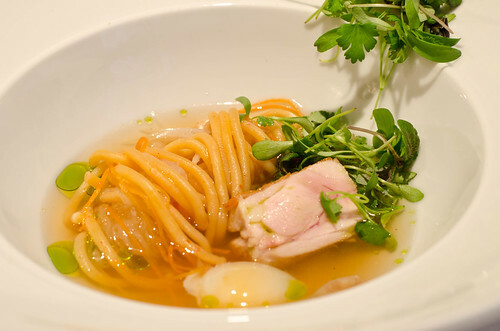 First Course 1: Kimchee (Noodles), Daikon Radish, Chicken Thigh, Quail Egg, Basil (Oil). 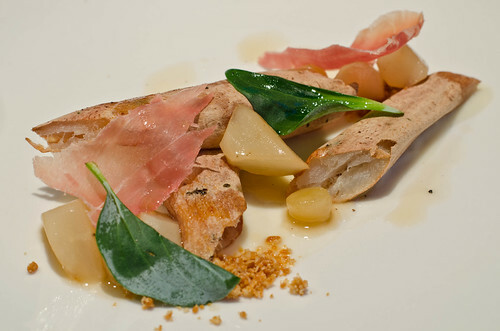 First Course 2: Salsify, Quince, Country Ham, Hazelnut (Dust). 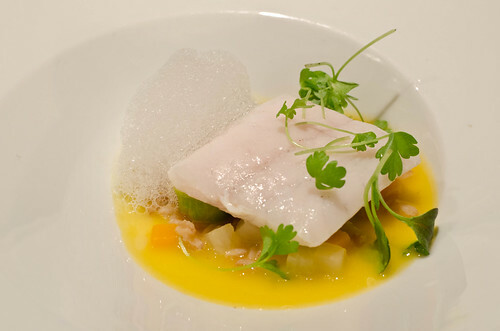 Second Course 1: Turbot, Butternut Squash, Brussels Sprout(s), Radish. 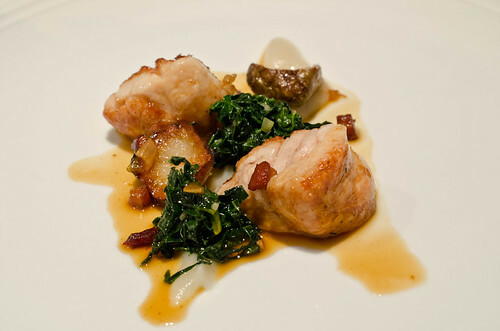 Second Course 2: Sweetbreads, Sunchoke, Black Kale, Bacon. 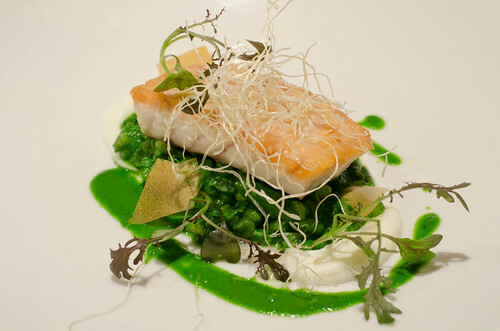 Third Course 1: Sturgeon, Toasted Barley, Broccoli (Puree), Lemon Pith. 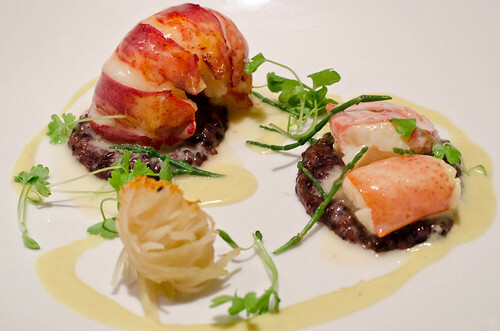 Third Course 2: Lobster, Black Forbidden Rice, Coconut (Sauce), Madras Curry. 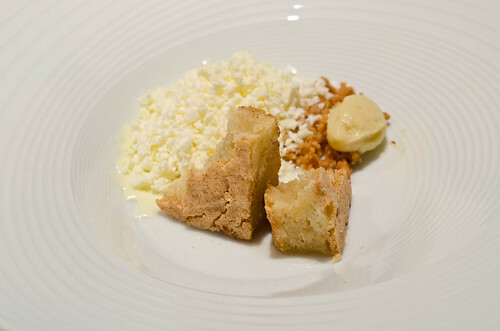 Pre-Dessert (complementary): Parsnip Cake, Cheesecake Ice-cream, Applesauce, Walnut crumble. 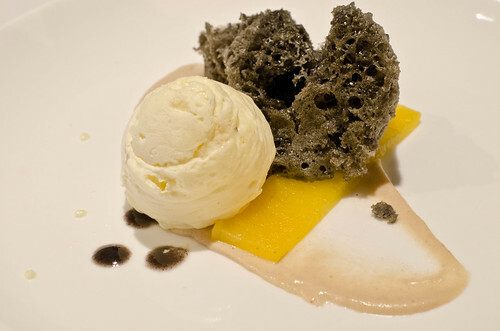 Dessert 1: Coconut (Ice-cream), Black Sesame (Cake), Pineapple, Banana (Sauce). Dessert 2: Chocolate (Mousse), Marshmallow, Peanut (Ice-cream), Caramel. 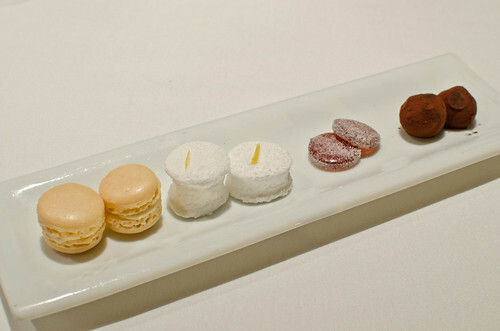 Post-Dessert (complimentary): Macaroons, Lemon Merengue, Pomegranate Jelly, Chocolate Truffles. 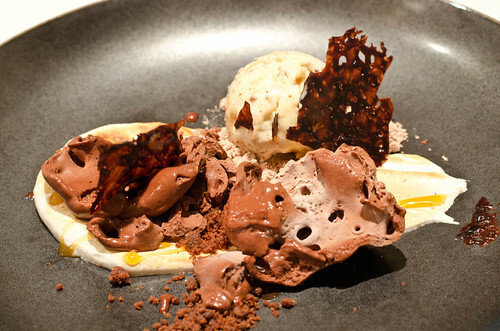 I have been sitting at my computer for some time struggling to form my thoughts about how to objectively assess the food and the dining experience at Volt with all the knowledge and acumen that I have in this regard. Ultimately, I have to resort to my gut feelings and the overall lingering impressions, without too much of a cerebral filter, in order to continue writing this review. Firstly, I must admit that during the meal, I was rarely excited about the dishes and the way the ingredients were treated. It was already a bit off-putting that the menu was quite allusive as it only alluded to the essences of the ingredients, and not the manner they were cooked or presented as part of the whole picture – notice the parenthesis in the descriptions that showed the lack of clarity on the menu. I believe that as diners, we usually get sated by filling up on quantity and/or by the saturation of flavorings and gustatory (that word again) excitement – the former was only fulfilled during this meal by the reordering of the bread basket and the amount of sugar from the four servings of desserts, which my companion and I thought fared the best. But that is really just carbohydrate and sugar!! Secondly, there were some serious and some rudimentary missteps in some of the dishes. 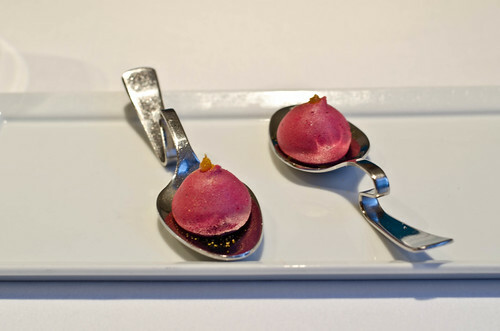 The opener of the Beet Macaroon paired with the Foie Gras Mousse did not “amuse my mouth” except saturate my palate with a mineral quality found in both ingredients; the dusting of the Cara Cara Orange zest did nothing to the dish nor could one discern this specific hybrid. The Kimchee Noodles did not have a single hint of the fermented vegetable, even when surrounded by an extremely mild broth; the chicken thigh did not contribute any flavor factor to elevate the dish beyond a flatline. The two meager slivers of Country Ham barely left a footprint on my tongue nor did it speak of any exceptional quality. The Sweetbreads was seared on the outside but completely raw (not rare) inside, and my companion literally pushed her plate away after the first bite (I think this put her on the potty for a few days); I sent the dish back to be recooked and it came back barely cooked enough – no reputable kitchen would serve a raw organ meat in this manner as we were that night! The Sturgeon fillet was overcooked and it had the consistency of a moist pork chop – unforgivable for seafood, especially from this calibre of fine dining. The Madras Curry sauce in the Lobster course was a total misnomer as its flavor had no hint of South Asian spices. The Black Sesame Cake tasted of Chinese food from the crushing of the black seeds that released the oil which permeated the whole cake (toasted seeds are rarely crushed in Asian desserts for this reason) – my companion and I were nibbling at it as glutton for punishment as we tried to wrap our brain around this “culinary joke”. Lastly, the service was efficient and professional. But puhlease, I have not seen so many anally-retentive young people in a long time. The attempt to provide high-end service only came across as characterless, unamiable, and after some time plastic. All this did was reinforce the lack of soul and connection my companion and I got from the dishes and the experience. I tried to joke with a couple of them but all I got back was silence or a are-you-serious chuckle – maybe they were not used to my remarks and dishes that were being sent back to the kitchen (I’m not easily intimidated by food or fine dining establishments, unlike some diners I noticed there). The staff need to lighten up! Whew! I got that out my chest now. Normally, I would not do a write-up that would trash a food establishment. Perhaps my struggles with this review is partly the above and my sense of obligation to write honestly about my experience at one of the area’s finest restaurants. I could have been one of those diners and tourists sitting at the $150 Chef’s table, mesmerized by the high-tech hoopla, bells and whistles, and the hype that this restaurant has garnered. Not me. Thanks for your feedback and I’m glad that you have had good experiences there. Maybe they have decided to change their menu style, perhaps after reading my complaint. LOL. However, I was more perturbed by the lack of “real” flavors that the listed ingredients failed to impart. Also, I thought that the kitchen’s cooking was not as proficient as one could expect at this top-notched/hyped place, which was borderline gimmicky – thus, my ONLY negative blog review. But that is nearly 2 years ago, and things do come and go.